There has been concern about his over-aggressiveness in the morning, especially throwing his wildly in the air. Draw reins were added to keep his head down and a more experienced exercise rider galloped him, and he was much better on Tuesday. I’m not going to do anything drastic at this late date, but he will have to harness some of that pent up energy if he hopes to win the Derby. Although I make it a habit not to become enamored with Pletcher’s brilliant Gulfstream horses, this horse just looks special. He’s won on fast and agonizingly slow surfaces and at quirky Tampa and is always increasing his margin at the wire. His gallop-outs after his works are consistently strong and he never seems to get tired. He must have tremendous lung capacity, as did his sire and broodmare sire, both of whom had blazing one-turn speed and could carry it long distances. Despite having never raced at 2 and with only four career starts, Bodemeister nearly pulled off a front-running victory in the Kentucky Derby, while In Excess still holds the 1 1/4-mile track record of 1:58 1/5 at Belmont Park. Always Dreaming’s :36 1/5 final three-eighths in the Florida Derby is the fastest of all the major prep winners. His works have been sensational whether he works alone or in company and he just keeps going. In his final work by himself, he rattled off eighths in :11 2/5, :11 2/5, :11 4/5, and came home under no urging in :12 1/5 before throwing in a pair of :13 eighths in his 7-furlong gallop-out in 1:25 3/5. With only one work between races, he needed a good stiff move and he got it, working 6 furlongs in 1:13 1/5 at Fair Hill in company and did it under no urging at all, with the rider’s hands perfectly still. He has really thrived since arriving back home in Fair Hill and just needs to relax early and settle behind the speed. It should be a cat and mouse game with Johnny V on Always Dreaming to see who gets first run. It could very well come down to who has the stamina to keep going, and, frankly, of the pace horses, his stamina is second to none, so don’t expect him to come back if he manages to strike the front. If he and Always Dreaming both live up to their potential we could see these two horses separate themselves from the others at some point. He does have that abysmal performance in the Fountain of Youth hanging over his head, but there is the possibility he displaced in that race, in which case you might as well just ignore it completely. But we just don’t know for sure. He did bounce back to run a super race in the Wood Memorial wearing a figure-8 bridle. One advantage he has over Always Dreaming is that we know what he can do if he gets in an eyeball to eyeball slugfest. 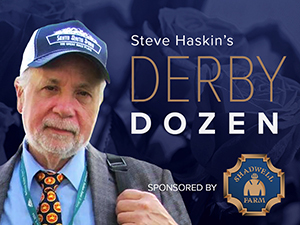 Some may fear a “bounce” after a 9 1/2-point improvement on his Thoro-Graph numbers, but he has nothing but fast figures to fall back on, so even he does regress a few points it still puts him in position to win the Derby. He’s not going to wow you with his works, and has been having pretty much maintenance drills at Churchill Downs without being asked for speed. After being at a huge disadvantage in the Florida Derby and regressing slightly as expected off a monster speed figure in the Fountain of Youth Stakes, he looks to be ready for another forward move. Of all the major preps, his :35 4/5 final three-eighths in the Florida Derby is the fastest of any of the Derby starters even though he was beaten 6 1/2 lengths by Always Dreaming over a track which worked against his running style. His pedigree says he will run all day, and he has the pushbutton turn of foot to make up ground in a hurry once his rider asks him for it. That should enable him to distance himself from the other deep closers who do their best running in the stretch. Casse said after the Arkansas Derby he was just going to have a short easy breeze, coming back in three weeks, and that’s what he had. It’s been a very odd road getting here, and it’s difficult to tell just how much foundation he has going 1 1/4 miles after so many detours. Many felt he’d never get this far, but Casse and his son Norm have done a super job getting him here. The question many people are asking is whether Classic Empire is the same powerful force he was at 2 and can he bounce back in three weeks after having only one race in 2 1/2 months and getting very little out of his race in the Holy Bull Stakes, from which he exited with a foot abscess that caused him to missing a good deal of training. There is no doubting this colt’s talent and class, and although there is some question whether he will be able to handle the crowd at Churchill Downs, I don’t foresee any problems. He appears to be a very intelligent horse who is inquisitive and likes to look that things and do things when he feels like it. But with all the activity at Churchill he should have plenty to occupy himself with. It’s all about whether he’s ready for the assignment after so many disruptions. Sometimes you let works dictate your final conclusions, and in his case, I have to admit he may be the smart choice to have at No. 1. But I have no reason to lower any of those above him at this late date, so I will definitely include him in most or all of my bets. I said several weeks ago he could be the big overlay coming off a non-threatening third in the Blue Grass Stakes, but watching him work I believe he is now going to get a good deal of support at the windows. He again showed his athleticism the way he cut the corners in his last work, and was very strong galloping out hugging the rail. What was also impressive was his final two eighths in :11 4/5 and :12 1/5, and final three-eighths in :35 3/5 into a headwind, with another :12 3/5 eighth past the wire, pulling up seven furlongs in 1:27 1/5 and not coming to a stop until midway on the far turn. He is so smooth and balanced and changes leads with such efficiency, he just seems to glide over this racetrack. What might surprise some people is that his Thoro-Graph figures in the Blue Grass Stakes and in the Sam F. Davis, which he won so impressively, are identical, so he has actually paired his last two starts, just as he paired his two stakes victories at Churchill Downs last year. And as he did the first time, he is very likely to improve off this pairing, and even a slight improvement will put him right there in the Derby. He is another who is not going to stand out in his works, but I love how focused and determined he is, with his head low and neck stretched out. He looks good physically and I’m expecting a much improved performance. Yes, he likely bounced in the Blue Grass Stakes off a strong figure in the Gotham Stakes, combined with a rough trip and should now move forward. He certainly has the pedigree to get the Derby distance, he’s run well at Churchill Downs, and Romans is due to win one of these. If you liked his Gotham victory and just like the way he’s been training, then he definitely is worth a win bet at juicy price and should be included in all or most of your exotic bets. And most of all remember the stats I passed along a couple of weeks ago. The horses coming out of the Blue Grass who run big in the Kentucky Derby are those who ran fourth at Keeneland (Thunder Gulch, Sea Hero, Invisble Ink, and Bluegrass Cat), with the exception of Closing Argument, who ran a well-beaten third, a neck out of fourth. In short, this could be your overlay, as there is little buzz surrounding him. He’s been the most consistently fast horse in the field speed figure-wise and he ran strong enough at 1 1/8 miles to suggest that maybe he can stretch out and still be competitive. I wouldn't have liked him nearly as much had Brown put blinkers on him for the Derby, but it looks as if he has decided against it. As I’ve been saying for a while, I still have this nagging feeling about him and wouldn’t be surprised at all if he runs a huge race, despite a questionable pedigree. Remember, it’s not that his pedigree cannot get him a mile and a quarter, it’s just a question whether the speed influences on top and bottom will determine his distance ability more than the few stamina influences sprinkled in there. But what keeps nagging at me are his gutsy victories in the grade I Hopeful and Champagne, two of the most historic 2-year-old races in the country, and how fast he ran in the latter, making up almost 10 lengths on a very fast horse. Based purely on the form of his last race, you have to consider him a major contender after easily defeating Conquest Mo Money, Hedge, Fund, and Irap, all of whom came back to run huge races, finishing either first or second in major stakes. He looks well muscled and is improving rapidly, and seems to have the perfect running style. He should be somewhere in midpack and after putting in a long sustained run in the Sunland Derby, he could get first jump on many of the closers. But we have to remember he did run a poor race in the Southwest Stakes with no excuse, so we have no idea how he will fare against far better horses in the Derby. He makes a striking appearance on the track and should be a decent price. He’s still pretty much a guess, as we really have no idea how good he is or how much improvement he’s made since the Southwest. I really liked his last couple of works and the way Shirreffs has been training him. Even though his 7-furlong time of 1:28 wasn’t very fast, Shirreffs was not looking for speed, focusing more on his rhythm and rating behind his workmate, as the colt had worked too fast before the San Felipe and Shirreffs did not want a repeat of that. In a surprising move he decided to have Gormley’s regular rider Victor Espinoza ride the workmate instead of Gormley. I liked the way he settled some 5 to 6 lengths behind the workmate and then, as he did last time, cut sharply inside him turning for home and drew off at will through the stretch. This horse has already proven he has the speed figures to run with the best of them and after regressing big-time in the San Felipe, he improved slightly in the Santa Anita Derby and must show even more improvement to get back to his figure in the Sham Stakes and be competitive in here. Moved him up after seeing how good he looks and coming to the conclusion that the Blue Grass Stakes was no fluke -- maiden or no maiden. And that if he could beat all those classy horses on his wrong lead the entire length of the stretch, what can he do if he changes leads? I love the way he looks physically; he is really muscled out, and I’ve been impressed with the way he’s been moving in those mile works, building up his stamina. I’ve never gotten a good look at him, but from what I’ve seen he stands out physically, and his connections feel it was just a matter of maturing. Being by Tiznow, you have to figure he would take a little while to mature and improve with experience. And he does seem to be putting it all together at the right time. The question with him is what the strategy will be this time. In most of his races he has been laying just off the pacesetter, but he can take a bit farther back if they ask him, which is what he likely will do in the Derby. I realize he’s been as high as No. 4, despite having only four career starts, and I know he looked sharp in his 5-furlong work in :59 3/5 , but he did miss a work and hasn’t run in 5 weeks, and as of now I don’t know his shoe situation. You can’t be thrilled when a horse has to wear bar shoes in this of all races. I love this horse and everything about him, but you can’t escape the questions regarding his quarter crack, his shoes and his seasoning. If Sharp waits until the last minute to ship him to Churchill Downs, as he says he will, then we really won’t get much of a look at him over the track. He is an enigma right now because I want to like him and I want to give him a big chance, but with such a deep competitive field you really don’t want to have foot and shoe issues hanging over his head. Last-minute return to the Top 12 after watching him on the track, especially his last work, and this marks a clean sweep forgiveness of all the subpar Blue Grass performances. I feel he deserves another chance, and there is a bit of a buzz forming. I’m still not totally convinced he wants to go 1 1/4 miles, but we know the talent is there and he looks terrific physically and appears to be in a zone when he’s on the track. I loved his last work, as he beat Patch despite going much easier of the two, but was surprised to see Patch get the better of him on the gallop-out, although you often see that from the horse working on the rail. It’s much easier for them to cut that corner into the clubhouse turn and get the advantage. I figured if I’m going to boost Irap and forgive the second, third, and fourth-place finishers I might as well give him a pass as well. He looked too good in his races at Tampa to totally dismiss them. For those looking for the pacesetter in the Derby, Dr. Kendall Hansen, owner of FAST AND ACCURATE, says his colt will go for the lead “no matter what it takes.” He added the horse will be hard ridden out of the gate and try to establish a two-length lead going into the first turn. When he ran Fast and Accurate’s sire Hansen in the Derby, the colt got stepped on coming out of the gate and was rank when they tried to rate him. Dr. Hansen does not want a repeat of that and will keep the horse out of trouble, figuring this is his best chance to win. So if the horse breaks sharply, it looks like we have our pacesetter, which would allow the riders of the stalkers to sit back and not have to worry about the horse on the lead. We’ll just have to see how far he can take them. The only thing I’m going to say about THUNDER SNOW, who arrived on Sunday looking in excellent form, is that unless you feel strongly that he has no chance, he is a must use saver bet, based strictly on the unknown factor and that he has already won at 1 3/16 miles, going so wide from the 13-post he ran even farther than that. I would have him in the Top 12, but have no idea where I would rank him. He is an extremely handsome colt who can run off and beat you by open lengths or beat you in a dogfight, as he demonstrated in the UAE Derby. And Godolphin passed up the English and French 2,000 Guineas to run him here. My main concern would be his lead changes and still some greenness, as he was far from smooth at the end of the UAE Derby, drifting and changing leads several times. I have no clue how he’s going to run, and chances are he’s not fast enough to beat the leading contenders, but I have enough respect for his talents, his conditioning, and his distance experience to make sure he doesn’t catch me napping. I also loved what I saw of him galloping Tuesday on his first morning on the track. SONNETEER made a striking appearance on the track Monday morning and then proceeded to open more than a few eyes by working a bullet half in :47. with fractions of :11 4/5, :23 1/5, and :35 1/5, with a five-furlong gallop out in :59 3/5, up six furlongs in 1:13 3/5. Looking at how smooth he was moving and how easily he was doing it, you have to wonder how in the world this is a maiden with 10 starts. A work like this, combined with the colt’s last two explosive stretch runs, likely sent researchers scurrying about trying to find the last maiden to win the Kentucky Derby. Speaking of Sonneteer, one of the most amazing aspects of this year’s Derby, which hasn’t been given its due, is the fact that Calumet Farm will have three horses – Hence, Sonneteer, and Patch -- in this year’s Derby, trained by three different trainers. Also making an excellent appearance physically on his first morning over the track was Santa Anita Derby runner-up BATTLE OF MIDWAY, who galloped a couple of times around the track. He is one horse whose strategy is open for debate. Considering how surprised everyone was to see him on the lead in the Santa Anita Derby and setting fast fractions under constant pressure, it is assumed we will not see a repeat of those tactics in the Derby. Of all the works I’ve seen over the past week, I don’t know that any was more impressive than Battle of Midway’s 6-furlong drill in company in 1:13 3/5. I loved the way he did it, the way he was striding out through stretch, and the way he galloped out. One horse who has been capturing people’s attention is STATE OF HONOR, who makes a grand appearance and seems to be taking to this track. The main problem with him is tactics, as he’s been trying to figure out how to win one of these races all year. He always runs big against the best around, but can never finish it off. In his last four races he’s run basically the same Thoro-Graph figure and hasn’t been able to take that next step. All three of Steve Asmussen’s horses have had good weeks, with UNTRAPPED especially making an excellent appearance. Asmussen hasn’t been training any of his horses – Untrapped, Hence, and LOOKIN AT LEE, hard. ROYAL MO has been doing well and looks good, but needs a late defection to get in the field. Well, folks, we have come to the end of the road. I feel as if the winter flew by, as I became immersed in the Dozen every week. I want to thank everyone who came along for the ride and who participated in the all the debates, opinions, and heated, but friendly, exchanges. That’s what racing and the Derby are all about. To all those whose Tuesday mornings centered around the Dozen and their morning coffee, thanks for bringing us into your living room, den, kitchen, or workplace – wherever you indulged in your cup of joe. Although the Dozen is officially put to bed for another year, there will be a selections and wagering column on Thursday.